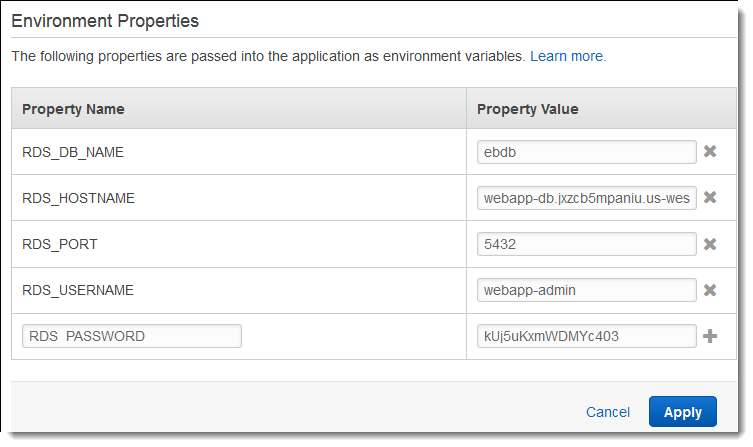 This tutorial walks you through the process of launching an RDS DB instance external to AWS Elastic Beanstalk. Then it describes configuring a high-availability environment running a Drupal website to connect to it. The website uses Amazon Elastic File System (Amazon EFS) as shared storage for uploaded files. Running a DB instance external to Elastic Beanstalk decouples the database from the lifecycle of your environment, and lets you connect to the same database from multiple environments, swap out one database for another, or perform a blue/green deployment without affecting your database. This tutorial was developed with Drupal version 8.5.3 and PHP 7.0. Use the Amazon RDS console to launch a Multi-AZ MySQL DB instance. Choosing a Multi-AZ deployment ensures that your database will failover and continue to be available if the master DB instance goes out of service. Creating a DB instance takes about 10 minutes. In the meantime, launch your Elastic Beanstalk environment. Use the AWS Management Console to create an Elastic Beanstalk environment. Choose the PHP platform and accept the default settings and sample code. After you launch the environment, you can configure the environment to connect to the database, then deploy the Drupal code to the environment. After installing Drupal, you need to connect to the instance with SSH to retrieve some configuration details. Assign an SSH key to your environment's instances. If you haven't previously created a key pair, open the key pairs page of the Amazon EC2 console and follow the instructions to create one. For EC2 key pair, choose your key pair. To create a Drupal project for Elastic Beanstalk, download the Drupal source code and combine it with the files in the aws-samples/eb-php-drupal repository on GitHub. Extract Drupal and change the name of the folder. Extract the configuration files over the Drupal installation. Verify that the structure of your drupal-beanstalk folder is correct, as shown. The beanstalk-settings.php file from the project repo uses the environment variables that you defined in the previous step to configure the database connection. The .ebextensions folder contains configuration files that create additional resources within your Elastic Beanstalk environment. .ebextensions/dev.config – restricts access to your environment to your IP address to protect it during the Drupal installation process. Replace the placeholder IP address near the top of the file with your public IP address. Create a source bundle containing the files in your project folder. The following command creates a source bundle named drupal-beanstalk.zip. It excludes files in the vendor folder, which take up a lot of space and are not necessary for deploying your application to Elastic Beanstalk. Upload the source bundle to Elastic Beanstalk to deploy Drupal to your environment. Choose the environment URL to open your site in a browser. You are redirected to a Drupal installation wizard because the site has not been configured yet. Database name – The DB Name shown in the Amazon RDS console. Database username and password – The Master Username and Master Password values you entered when creating your database. Advanced Options > Host – The Endpoint of the DB instance shown in the Amazon RDS console. The Drupal installation process created a file named settings.php in the sites/default folder on the instance. You need this file in your source code to avoid resetting your site on subsequent deployments, but the file currently contains secrets that you don't want to commit to source. Connect to the application instance to retrieve information from the settings file. Open the instances page of the Amazon EC2 console. Choose the application instance. It is the one named after your Elastic Beanstalk environment. Follow the instructions to connect the instance with SSH. The command looks similar to the following. Get the sync directory id from the last line of the settings file. The file also contains the sites current hash key, but you can ignore the current value and use your own. Assign the sync directory path and hash key to environment properties. The customized settings file from the project repo reads these properties to configure the site during deployment, in addition to the database connection properties that you set earlier. SYNC_DIR – The path to the sync directory. HASH_SALT – Any string value that meets environment property requirements. Finally, the sample project includes a configuration file (loadbalancer-sg.config) that creates a security group and assigns it to the environment's load balancer, using the IP address that you configured in dev.config to restrict HTTP access on port 80 to connections from your network. Otherwise, an outside party could potentially connect to your site before you have installed Drupal and configured your admin account. Copy the customized settings.php file into the sites folder. The sample application uses configuration files to configure PHP settings and create a table in the database if it doesn't already exist. You can also use a configuration file to configure your instances' security group settings during environment creation to avoid time-consuming configuration updates. See Advanced Environment Customization with Configuration Files (.ebextensions) for more information.